The U.S. 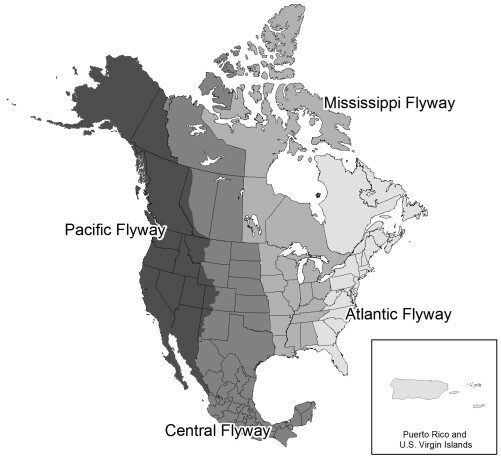 Fish & Wildlife Service and its partners have identified four administrative Flyways (Atlantic, Mississippi, Central and Pacific) based largely on routes the birds follow as they migrate between nesting and wintering areas. The purpose is to facilitate management of migratory birds and their habitats. “Some scientists believe migratory birds take they navigational cues from the sun, moon and stars. Others think they simply follow geographic landmarks like rivers and mountains,” writes Matt Dolkas for the Peninsula Open Space Trust. Regardless, these migratory birds consistently follow the same flight paths. Not all of the migrating birds travel the entire Flyway. Most travel the leg of the journey that brings them into warmer temperatures that are closer to the equator. When do birds migrate? In North America, the birds that migrate do so in the late summer though the fall and in the late winter through the spring. Migrations generally follow a north-south pathway, although a few bird species — namely oceanic birds — may migrate in a circular pattern. Because it’s hard to provide exact dates when birds migrate, Perky-Pet® has developed a Bird Migration Timeline for fall and spring migrations. According to Perky-Pet® some of the migrating birds in the Pacific Flyway include: American Crow, American Goldfinch, American Robin, American Tree Sparrow, Anna’s Hummingbird, Band-tailed Pigeon, Black-chinned Hummingbird, Bohemian Waxwing, Brewer’s Blackbird, Brown-headed Cowbird, Cassin’s Finch, Cedar Waxwing, Chipping Sparrow, Common Redpoll, Dark-eyed Junco, Evening Grosbeak, Fox Sparrow, Golden-crowned Sparrow, Hermit Thrush, Hoary Redpoll, Lesser Goldfinch, Northern Flicker, Pine Siskin, Purple Finch, Red-breasted Nuthatch, Red-winged Blackbird, Ruby-crowned Kinglet, Rufous Hummingbird, Song Sparrow, Varied Thrush, Western Meadowlark, White-crowned Sparrow, and Yellow-rumped Warbler. "We had a great morning birding and looking at the views. Because it was a clear day, we were able to see 5 islands, Santa Barbara, San Nicholas, Anacapa, Santa Cruz and Santa Rosa. There were many juncos, spotted towhees and other sparrows, oak titmouse, hawks and the highlight of the day was the white-throated swift." The Ojai Valley, including Meher Mount is a bird enthusiast's delight. Pause a moment, and even the casual bird watcher can view the different species that find Meher Mount a welcome home or a good place to visit during migration on the Pacific Flyway. “Bidding for the Benefits of Birds,” NASA Science: Share the Science, accessed online March 20, 2019. Erin Blakemore, “The amazing story of the Great Pacific Flyway and its migrating birds,” The Washington Post, November 5, 2017, accessed online March 20, 2019. “Flyways,” U.S. Fish & Wildlife Service, Migratory Bird Program, accessed online March 20, 2019. Matt Dolkas, Content Marketing Manager, “What You Should Know About the Pacific Flyway,” December 11, 2017, Peninsula Open Space Trust, Palo Alto, CA, accessed online March 20, 2019. “When Do Birds Migrate?” Perky-Pet®, Woodstream Corporation, accessed online March 20, 2019. Article also gives guidelines on the the timing of bird migrations in North America. “Bird Migration: Birds of the Pacific Flyway,” Perky-Pet®, Woodstream Corporation, accessed online March 20, 2019. Article also gives tips on managing backyard bird feeders for various types of birds. “Notes from the Field…Adele Fergusson Meher Mount,” The California Condor, March 2019, Ventura Audubon Society, accessed online March 20, 2019.